Manchester's famously rainy days are getting wetter, according to a university weather expert. Dr Andrew Russell has sifted through data collected over decades to determine how the city's rainfall has changed over time. He said the last 30 years have seen a sharp increase in rainfall, with a third more rain falling on rainy days. Dr Russell's claims are made in the BBC North West Wild Weather programme (Monday 20 September 2010). Greater Manchester has certainly had its share of extreme weather in 2010. Debates continue to rage about whether such incidents are evidence of man-made climate change. But if one weather type defines Manchester more than any other, it's rain. Dr Andrew Russell worked until recently at the Centre for Atmospheric Sciences at the University of Manchester and has studied the city's rainfall over the last three decades. What he has discovered suggests the phrase 'it never rains, but it pours' could have been coined with Manchester in mind. "The particularly interesting part of the record is the last 30 years where we have seen a 10 to 15% increase in rainfall," he said. 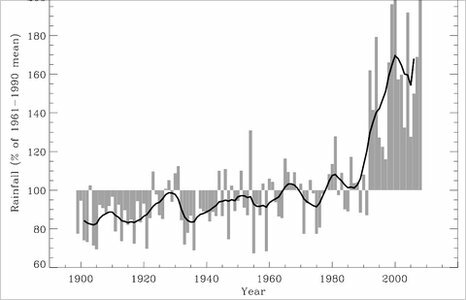 "And then, when we look into that in more detail, this increase has come not from seeing more rainy days, but that the rainy days have been getting wetter." "For example, in the first half of the 20th century, an average rainy day in Manchester saw about 4.5 mm of precipitation. "More recently (1990 - 2010), the average rainy day here sees more than six mm of rain, which is a 33% increase." It's a trend towards heavier rainfall that may well explain the flash flooding that hit the region in the summer of 2010 following the driest start to a year for 80 years. [The hailstones] sort of eased off and then it started raining, but raining like I've never seen it before or since. It just bounced off the floor, coming down in sheets. 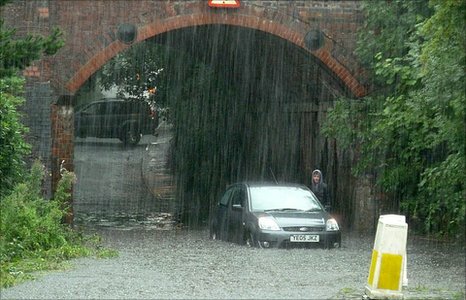 After months of drought, the heavens opened in August which left areas of Cheadle, Bramhall and Ramsbottom under several feet of water. Such incidents, of course, are not unique. 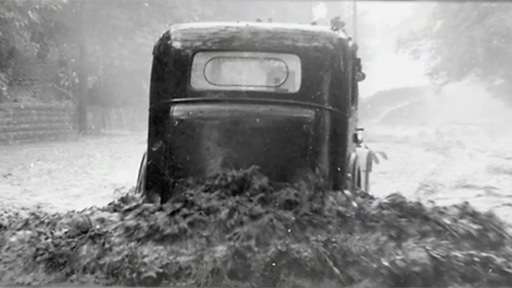 In fact, one of the more bizarre incidents of flooding happened on 18 July 1964 to the north of Manchester on the Lancashire border. Heavy rain in the Rossendale Valley had left the hills around Haslingden saturated. Brian Pickup was standing inside a shop when the town was hit by a sudden hail storm that left the drains blocked with ice. "If you can imagine you were stood three or four yards back from the door at the counter, we were getting hit by hailstones," he explained. "That sort of eased off and then it started raining, but raining like I've never seen it before or since. "It just bounced off the floor, coming down in sheets." A deluge of water then poured into the town centre, swamping vehicles and leaving residents shell shocked at the violence of the weather on a summer's day. The city's Victorian sewer system controls the flow of water in Manchester to a large degree but it wasn't always the case, as an earlier example of flooding shows. In July 1872, a huge storm hit the North West with a month's worth of rain falling in one day. In the Bradford area of Manchester, the River Medlock rose by 12 feet, breaching the walls of Philips Park Cemetery. A report in the Manchester Courier told a tale so grim that the authorities were forced to start digging sewers to stop it happening again. "The flood increased in depth and power, carrying away not only tombstones but actually washing out of their graves, a large number of dead bodies... dead bodies were observed floating down the river... it is impossible to calculate how many had been swept out of their final resting place but the number is not short of fifty." Watch a special programme on the region's Wild Weather at 7.30pm on BBC One on Monday 20th September.